Here we are on a trail that sounds so old and reminds me of the Ice Age movies. Hiking the trail seemed boring at first until you start to take a closer look. Found in and around Wisconsin, there are several spots to park and hike/ walk along a trail. There was a lake in the middle of our hike in South Kettle Moraine, WI. So happy to be photographing what my artistic eye sees. My boy scouts love to be walking along the trail, finding interesting objects and being one with nature, I enjoy it just the same. Excited that the warmer weather is here in this northern climate lasting where the cold weather seemed never ending. What do you see in the top photo? So the story goes …..I was awarded the “Spark Plug Award” for my volunteer efforts at the IP District dinner last month. I was totally surprised while feeling appreciated for helping the Boy Scouts in their marketing, communications and PR efforts. Officially I hold a committee position. Last year, I was seeking a venue where my intellect, experiences and my Masters degree in leadership could be utilized. I’m sure my position will evolve over time as additional opportunities arise. I’m Excited to be alive at a crossroads of time where young women can join the BSA while achieving the rank of Eagle. This will surely open doors for more female leaders. I love the outdoors and adventures as much as my boys do. We are all zip lining this week on our road trip. Wherever the road & adventures may take me… I’m ready to take on the leadership challenges going forward… and of course with my camera by my side, always. It’s Valentines Day and a day of Love. This love should be felt and expressed year round, every day. As I went about my photography shoots I saw the shooting in Florida pop up on my radar. How sick, how sad. I’d like to forget the evil in this world for a day. One can not feel compassion and sympathy for the victims as the story unfolds. I like to focus on the Olympics that unit the world while bringing joy to our hearts. May the remembering of those you love and are dear to you remind you of the love that remains and connects us all. The white roses contains all colors as your eyes see only one. Which color do you see? May it Brighten your day, despite the odds. Love all, unite, not fight. So…last year we had snow fall, but it always fell heavy on the weekend and roads were clear and ready for buses to bring kids to school and cars on the road back to work. Winter returns as the flakes began to blanket the ground last Thursday giving us enough snow to close schools based only on the weather forecasts. Friday morning we all woke up to winter white piled high over a foot while hearing snowblower engines outside. The photos look almost black and white before being shoveled to clear transit paths. With nothing scheduled to shoot, I planned to stay home to work on some personal projects, but the school closings kept me home for other reasons. With the Flu circulating and having one child just getting better, I preferred them to stay inside and finish their Pine Wood Derby cars for Saturday’s event. Luck would have it, my car battery did not start and we had to find a ride to have our mini cars race. The event was exciting and seeing all those smiling kids faces makes you smile. What does this have to do with my photo journey? Lots.. I photographed all the kids photos for their licenses, I also took challenging action images without a flash. So fun to watch as it was the last one for us. I have spend a tremendous amount of time obtaining a Masters degree in Leadership in hopes to finding a better paying, challenging, more suitable job to align with my corporate experiences. Fate sometimes turns you around. Since June 2016, I spent time offline focusing on my job-search absent from posting a blog. I spent more time with face to face communications, interviewing and more time away exploring new corners of the globe. Taking real estate photos was not planned, but I sent my interest into the web site only to be called a few months later. I learned so much and dealing with different people brings my educational knowledge to real time. I’m a problem solver, image producer, communicator, sales and marketing assistant at times while being a time manager, project manager and creative technical artist. Taking photographs is more than showing up. ( more in a future post). I believe most people blog because it makes them feel good and when they connect with other like minded people, they get a bit of endorphins released, bringing a smile to their faces. It’s a type of therapy. We improve our craft, share our stories to a wider audience and can reach people across the globe. This can even lift a reader up and inspire a stranger. We share our personal stories to help others, admit our mistakes and celebrate our victories. I have “met” so many wonderful bloggers unselfishly being vulnerable to help others who may be suffering. Blogging makes us better individuals as we stretch our words and images to fit across the universe. Perhaps someone quietly listens, looks without a response and eagerly awaits your next post. I certainly have missed posting my blog with time restraints and lack of digital space left. With the new year beginning, hopefully my life will be more productive and profitable as I’ve invested in a new Wide angle lens and a very sturdy tripod. Currently my Pro camera is being repaired since it slipped off my tripod with the flash, taking the hot shoe with it. Never a dull moment, I learned to be creative until I could send in my camera for repair. Can’t wait to be back on the road. Happy New Year! Around the world. So we Americans call this celebration day “Happy Fourth of July.” Are we happy because of our independence from Britain 241 years ago or are we happy that we have another day off from our daily duties at work? For some we may have to work and if you are a parent, there are no days off. As the years go by and I get older I wonder what my children will remember this day as? Is it the beautiful fireworks, loud noises, fun sparklers, marching in parades, summer picnics or fun with friends. From my childhood memory bank it’s the fireworks I remember most and how we would only see them on the Fourth of July. As I got older, learned history in school, I appreciated the freedom part but questioned its validity. 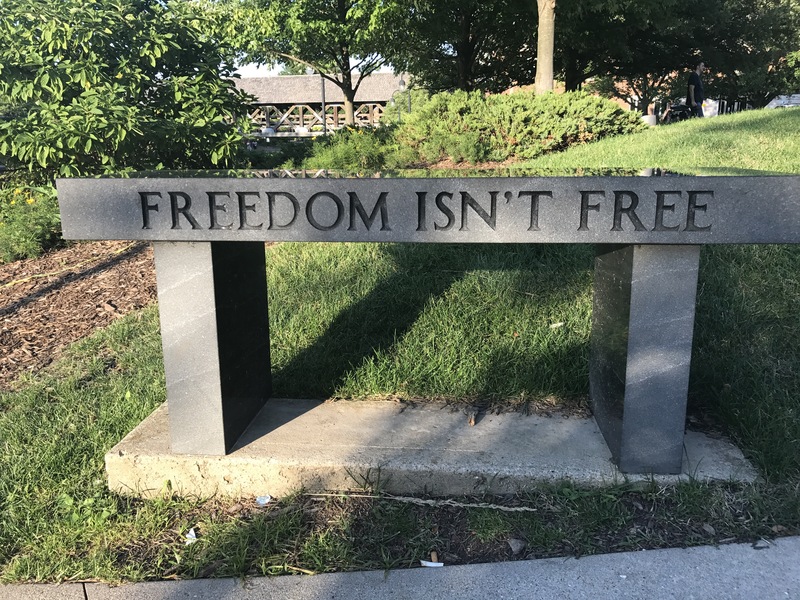 Is freedom not without cost of some kind? Be it money, guilt or trading of some kind? I’m no historian, (www.history.com) I hated reading or hearing about any war, as history always involves wars, yet somehow the leaders were the courageous, victorious and remembered ones. Why? How many men and women and families broken did it take for that passage we call freedom. From the Native Americans who were kicked to the curb, led to leave their lands on their trail of tears to the American revolution leaving many more dead. Is that leader a hero, was war necessary, perhaps in ending slavery, yet it still exits today (human trafficking) . Do we remember the names of those before us who fought in vain? Humans are not numbers, they are Just like everyone else. Immortal. Fighting is such an ugly word, but not one person can stop it from happening. People fight their own family even if it doesn’t involve weapons or blood. While I respect and appreciate all walks of life, I have a distain of hatred for the evil that exists and the people who perpetuate anger, hatred and wars on others. For now, like many others I plan to enjoy the fireworks for the freedom it symbolizes and the lives it saved and the lives that saved us. Freedom does come with a heafty cost and I sure wish it wasn’t from the tragic lives already lost. Happy Fouth to those in America and those who celebrate around the globe with us! God bless America and this World.